- On what platforms will they be available? 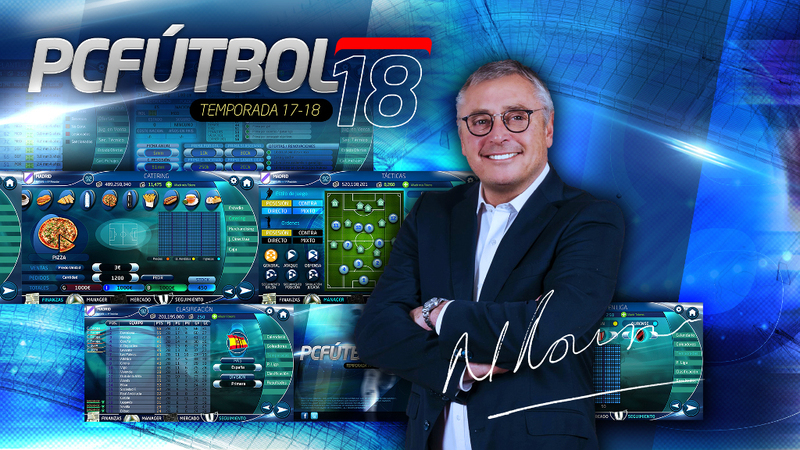 PC Football 18 will be available on PC, MAC, Android and iOS. - What are the technical requirements of PC Football 18? In Android it is necessary to have installed version 4.2 of the operating system and a device with 1GB of RAM or more. In iOS it is necessary to have installed version 7.0 of the operating system and a device with 1GB of RAM or more. - Do the versions incorporate micro-payments? The full version of PC Football 18 does not include them. It is possible that in the future micropayments will be incorporated in some versions. In any case, you can have a complete experience and the 100% of the game without using micropayments. - Is there an online mode on PC Football 18? The PC Football 18 online mode is in full development and we plan to incorporate it in future updates. - Will new features be incorporated in future updates? Yes, in the next updates we will incorporate new features such as online challenges and the possibility of continuing the game in different devices and even a new game mode. - What is the role of Michael Robinson in PC Football 18? Michael is one of the game souls. Apart from being the main prescriber of the game, he represents all the values that the game has maintained over the years. Part of the structure of the game corresponds with technical aspects that he, personally, highlights in his vision of the tactics and strategy of the game. It is thought to have in future updates a game mode specially designed by him as a variant of the classic modes represented in the game. - How does the transfer process work? There are two ways to sign on PC Football 18. The first is to look for a specific player, for that you must enter the "Market/Transfer List" menu and add a player navigating through the different teams of the game. The second is to order your Technical Secretary to look for players that meet certain characteristics. In this case you should go to the menu "Market/Tech. Secretary" and set the search filters. Once you have done either of the two actions and after a few days have passed, you will receive information about the players that you requested in "Market/Transfer List" or those that the secretary has found in "Market/Sign". At this point you must make an offer to the player and after a few days you will receive an answer if the player accepts or rejects it. - Can I sign a specific player? Yes, for this you must enter the "Market/Transfer List" menu, add a player navigating through the different teams of the game and follow the process mentioned in the previous question. - How does the lineup screen work? There are three lists on this screen. From left to right are: starting players, reserve, ruled out. You only must exchange the players between the 3 lists to prepare lineup of the next game. - How does the tactics screen work? In the field of the tactics screen is where the players are placed on the field. To make changes you must drag the elements considering the following considerations: The blue rounds indicate the position of the player. The green arrows, his influence area. - Can I continue my game on another device? We are working to make this possible and very soon it will be implemented. - Can I edit the data of teams and players? - How do I change the average of the players? - I have already edited the data. How do I charge them in my game? At the end of the edition you will be provided with a code. This code will have to be entered in a desktop application (will be announced soon) that will be responsible for preparing all your changes to be understandable by PC Football 18. When this application finishes the process, you will only have to re-enter the code in the section "PCF PLUS" of your PC Football 18 application. - Can I upload the edited data of other players? Yes, in the main page of the editor, select the option "Load Community Changes" and choose a version of the list that will appear. The download button will provide you with a code that you will have to enter in the "PCF PLUS" section of your PC Football 18 application.